Would you believe it, the State of the Nation address (SONA) actually kicked off on time for once, with President Cyril Ramaphosa delivering it for the first time. But what were some of the highlights? And more importantly, what did Twitter find most exciting? “The calm before it starts,” tweets @ParliamentZA, well before proceedings began. There was even a moment for an unnecessary slow-mo video. President Cyril Ramaphosa was “apprehensive” ahead of the SONA. But National Assembly speaker Baleka Mbete wasn’t too far from ensuring that everything was in order. She later walked the new President through the procedure. It was then announced that former President Jacob Zuma would be absent. “The nation awaits,” wrote Minister of Police Fikile Mbalula. The politicians then arrived in their glad rags. Even former police commissioner Bheki Cele was there. And former Deputy President FW De Klerk too. Thabo Mbeki was also spotted in the gallery, and received warm applause during SONA. The EFF however arrived after the Red Carpet was closed. And they were vocal. 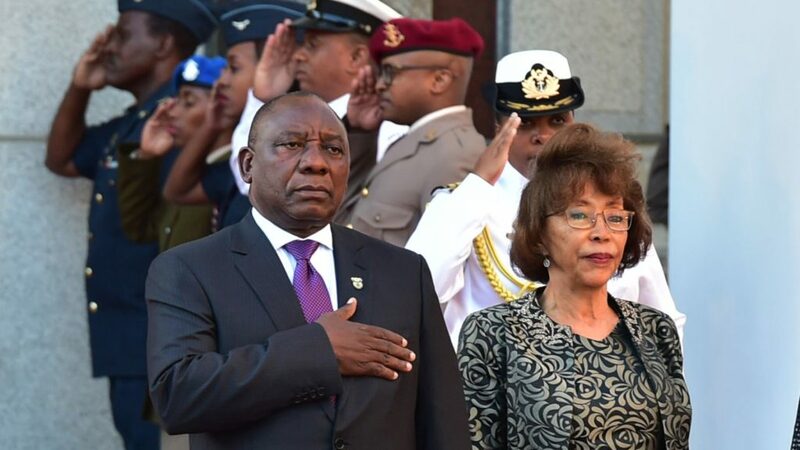 President Cyril Ramaphosa arrived a little later than expected, but the anthem and 21 gun salute did sound around 7pm on the night. The procession into Parliament soon followed. Then it began. On time. And people got the feels. Initially, not a peep was heard from the EFF. Ramaphosa however soon got into the heart of his address. He broke into Afrikaans to explain the fundamental transformation he envisions for the country. “We are building a country where a person’s prospects are determined by their own initiative and hard work, and not by the colour of their skin, place of birth, gender, language or income of their parents,” Ramaphosa noted. Well that is a Mandela touch right there. The first language other than English Ramaphosa uses: Afrikaans. He took time to honour both Albertina Sisulu and Nelson Mandela. “We should put all the negativity that has dogged our country behind us because a new dawn is upon us. It is a new dawn that is inspired by our collective memory of Nelson Mandela and the changes that are unfolding,” he continued. Inequality, transformation and job creation took a large slice of the SONA cake. “Our most grave and most pressing challenge is youth unemployment. It is therefore a matter of great urgency that we draw young people in far greater numbers into productive economic activity,” Ramaphosa explained. Mining was on the agenda too. The water crisis received a brief mention through the infrastructure section of the address. “The country remains gripped by one of the most devastating droughts in a century, which has severely impacted our economy, social services and agricultural production,” Ramaphosa noted later in the speech. And even startups received a mention. “Government will honour its undertaking to set aside at least 30 percent of public procurement to SMMEs, cooperatives and township and rural enterprises. We will continue to invest in small business incubation,” Ramaphosa added. But agriculture and land redistribution were mentioned together hand in hand. And became the first contentious topic on the night. “We will accelerate our land redistribution programme not only to redress a grave historical injustice, but also to bring more producers into the agricultural sector and to make more land available for cultivation,” Ramaphosa continued. “Ramaphosa realizes that agriculture remains the biggest economic contributor. How will food security be secured when land is expropriated?” the Vryheidsfront Plus tweeted. President Cyril Ramaphosa, tipping the hour mark, then mentioned the fourth industrial revolution, noting that South Africa should push its focus on scientific development, as well as mobile technologies. “[We will] stablish a Digital Industrial Revolution Commission, which will include the private sector and civil society, to ensure that SA is in a position to seize the opportunities & manage the challenges of rapid advances in information and communication technology,” he added. But all South Africa wanted to hear was free Twitter for life. Basic education, health and a soon-to-be implemented minimum wage came next. Crime was also briefly touched on as well. Government departments and state-owned enterprises came next, with cheers all around the house. “Government will take further measures to ensure that all state owned companies fulfil their economic and developmental mandates,” Ramaphosa noted. And the President confirmed that irregularities within state-owned enterprises will be addressed. Minister of Public Enterprises Lynne Brown seemingly enjoyed that moment, Twitter joked. And then, the biggest cheer on the night from the Assembly erupted for state capture. “We must fight corruption, fraud and collusion in the private sector with the same purpose and intensity,” the President noted. Slowly drawing to a close and some 80 minutes into his speech, Ramaphosa then called for all public servants to grab a hypothetical mirror. “Fellow South Africans, our country has entered a period of change. While change can produce uncertainty, even anxiety, it also offers great opportunities for renewal and revitalisation, and for progress,” Ramaphosa added, quoting Hugh Masekela. “Now is the time to lend a hand. Now is the time for each of us to say ‘send me’. Now is the time for all of us to work together,” he concluded.